Elizabeth is a blogger, artist, writer, and Girl Scout volunteer. She used to be on Squidoo, and came over here to HubPages after that. It's fun to play Maori Sticks. Maori Sticks is a fun Girl Scout game. It is popular in New Zealand and across the world. Girl Scouts in particular really like this game. It is played at events, and at camp. It is a game of skill and singing that uses small sticks, 2 per person, and a partner. A whole group of people can play this game at the same time. Each person sings and rhythmically clicks the sticks together and throws them in different patterns. 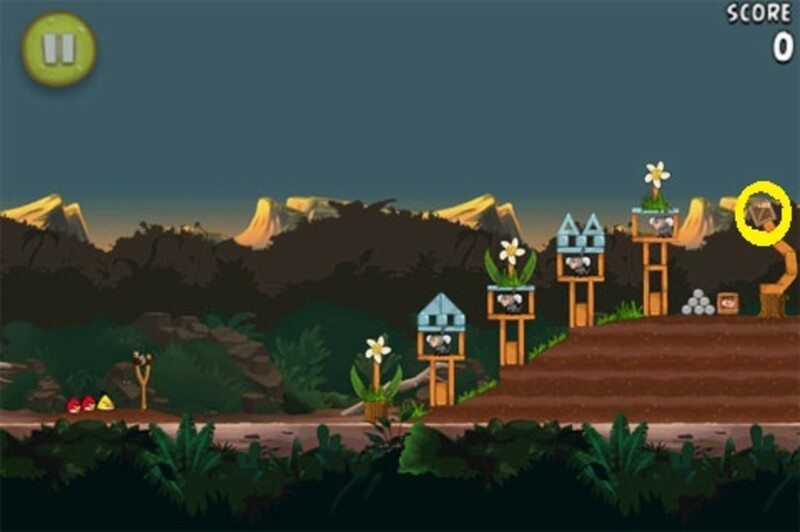 It is a really fun game - - and challenging, too. In New Zealand, there are many variations of this game. I learned one where the song was in English, but the tune was very much the same as the Maori tune. Some people call these sticks Lummi Sticks. This Lummi Stick performance photo is from Hillaryp1 on Flickr. Maori Sticks is both fun and a traditional game. 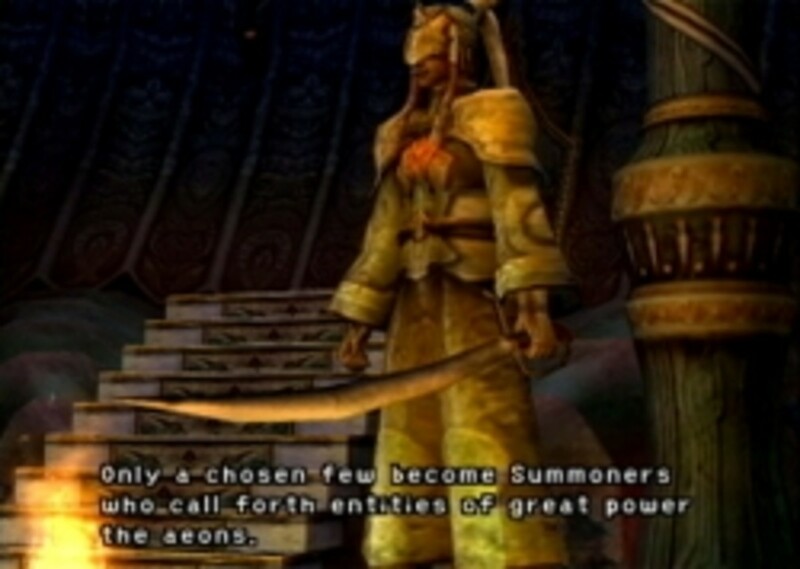 This has some of the actions I remember, like the stick flipping part. There are many different ways to flip the Maori sticks. The rhythmic sticks are fun to learn, and interesting. Girl Scouts can learn this game at a meeting, or while camping. The sticks can be made from old broom handles. The tune to this version of the Maori Sticks Game is much like the one I remember. Scroll down for the English words I used for the song. Want to find out about other games? This book has lots of other games you can play with Girl Scouts. It's a great resource. I own one! 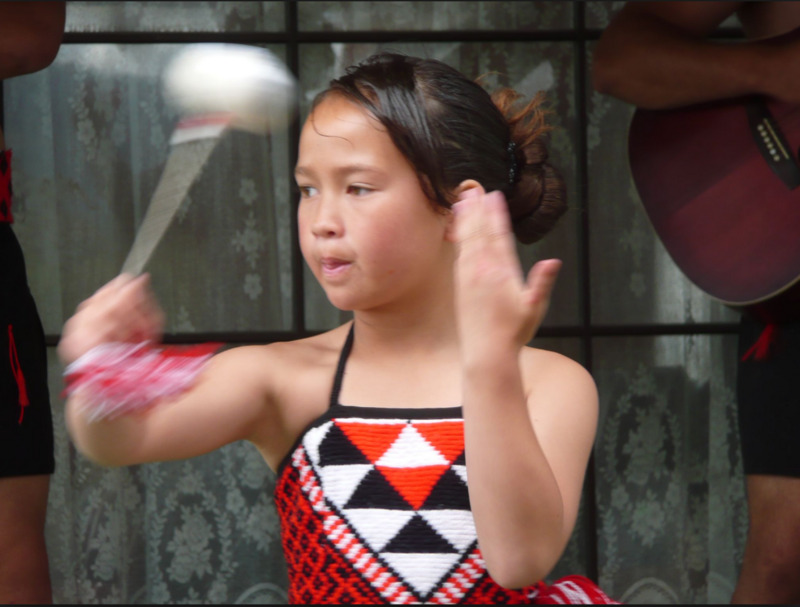 Young Maori girl in traditional dress dancing a poi. Here are English words to this song. The English words for this Maori Stick song are here. I learned the song and words in Wisconsin. I learned the songs and words in Wisconsin, and have taught them to troops in Kentucky too. Smile o-oh my-y father, but ne-ver de-eny me, but ne-ver de-eny me the pleasures of dreaming. (refrain) Hey away - my love's gone away. Nay may he come again to me. This game is easy to play, and easy to learn. As people get more into the game, they learn intricate tossing and flipping maneuvers using two sticks. They toss a stick across to their partner, who tosses their sticks across too. You can flip the sticks next to you, and in front of you. Then, during the refrain, everyone sings and taps the sticks up into the air. The most complicated part of the Maori Stick Game that I learned involves tossing the sticks outside and inside to your partner. It's a fun part of the Maori Stick Game that takes real skill! Maori Sticks and a Song - This video shows people playing Maori Sticks and singing too. This is not the song I remember, but the refrain tune is the same as I remember singing. You can see some of the Maori Stick movements in this video. They are having fun too. The English version to the Maori Stick Song is above. Here is a picture of people playing Maori Sticks. - This is neat! They are in a long lodge building in Hawaii. People playing Maori sticks in a lodge building. Notice how everyone is holding their sticks in front of them or by their side. They are getting ready to play the Maori Stick game, which is a game with many different skill levels. The photo here is by Darryl Mitchell on Flickr. There are many variations of this game around the world. 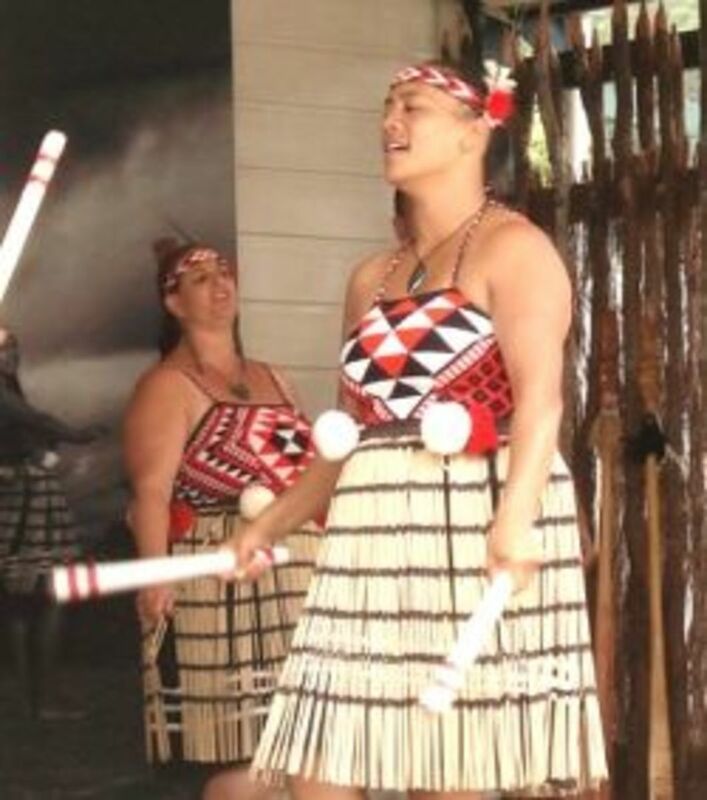 A Maori woman with long sticks. The Maori Stick game I know is played on the ground. This version is played standing up. This photo is of a group of people using sticks in a dance and game. 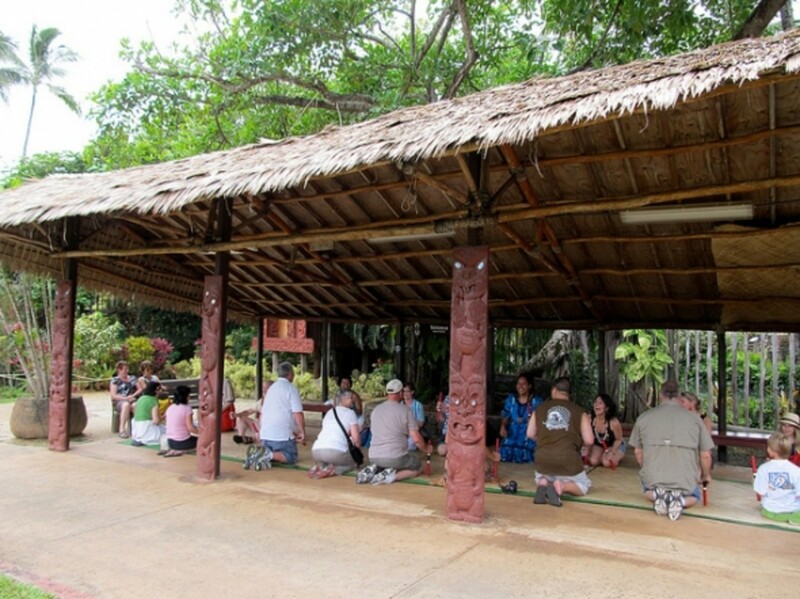 This may also be a demonstration of another kind of Maori Stick game for tourists. This photo of a Maori woman with long sticks is by Hillaryp1 on Flickr. The women in the photos are standing up. In the Girl Scout Maori Sticks game, everyone sits or kneels on the floor. 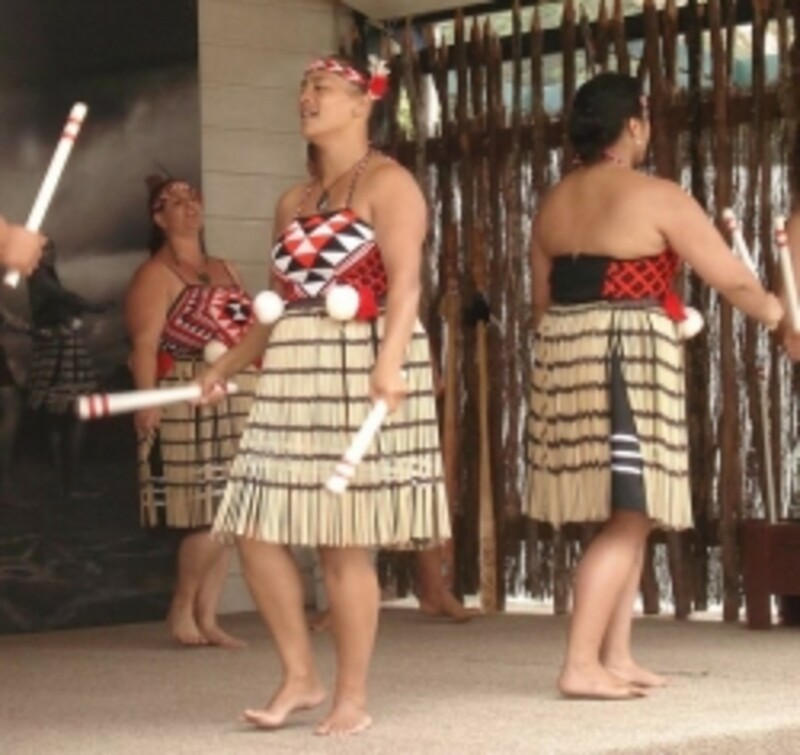 Here are more real Maori people dancing with long sticks. - I love the man on the right. You can tell that sticks are indeed part of the Maori culture here. I bet this is a popular tourist attraction there. Check out the man on the right, who does the fun Maori facial expressions! Check out when he sticks out his tongue. That is also part of some traditional Maori men's dances. I read somewhere that making this face, which looks fierce, is part of showing bravery and power. Here is one helpful link I used to make this lens. - I thank everyone who had info. out there too! Thank you for visiting my lens today! 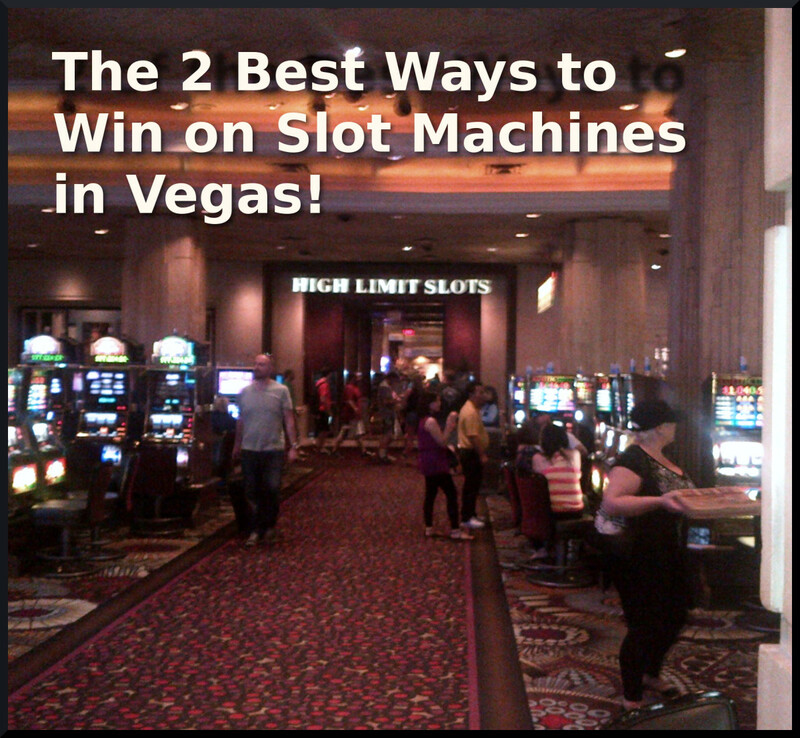 The 2 Best Ways to Win on Slot Machines in Las Vegas! Leave your comment! - Thank you! @SusannaDuffy: That is so interesting! Some troops still use the real song. I learned it in an English translation. Thanks for sharing about your dance! @Mickie Gee: Yes! I'm so glad you liked this page. I was a Girl Scout until I was in 8th grade in the US. I don't remember this song so I loved finding this page about it. Long live the GSA! @jmsp206: It is so much fun. Writing about it makes me want to try it again! @TeacherRenee: This game is a lot of fun. There is a lot of laughing that goes with it! @HealthfulMD: Yes, people need to be careful when throwing these! Learning it slowly - a little at a time - is a safe way. We didn't learn this when I was in Girl Scouts. Looks like fun, but a bit dangerous. Looks like a really fun game! Sounds like fun and an interesting part of Maori culture.